SPAWN creator TODD McFARLANE presents an irreverent, action-packed, tongue-in-cheek new adventure unlike anything you’ve seen before. 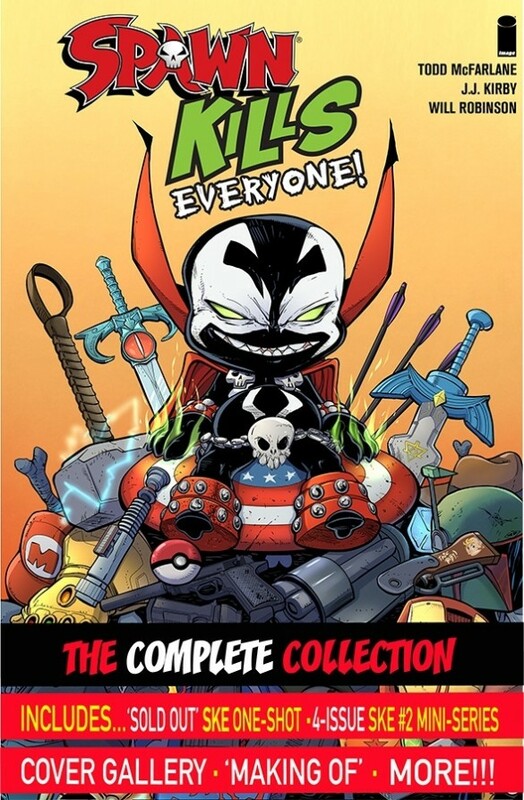 Collecting the sold-out SPAWN KILLS EVERYONE one-shot and the hit sequel miniseries SPAWN KILLS EVERYONE TOO for the very first time, this parody adventure pits Spawn against, well… everyone! Collects SPAWN KILLS EVERYONE! (ONE-SHOT), SPAWN KILLS EVERYONE TOO #1-4 HOLLYWOOD NEWS! Soon to be a major motion picture from Blumhouse Productions, directed by Todd McFarlane, and starring Jamie Foxx as Spawn and Jeremy Renner as Twitch.